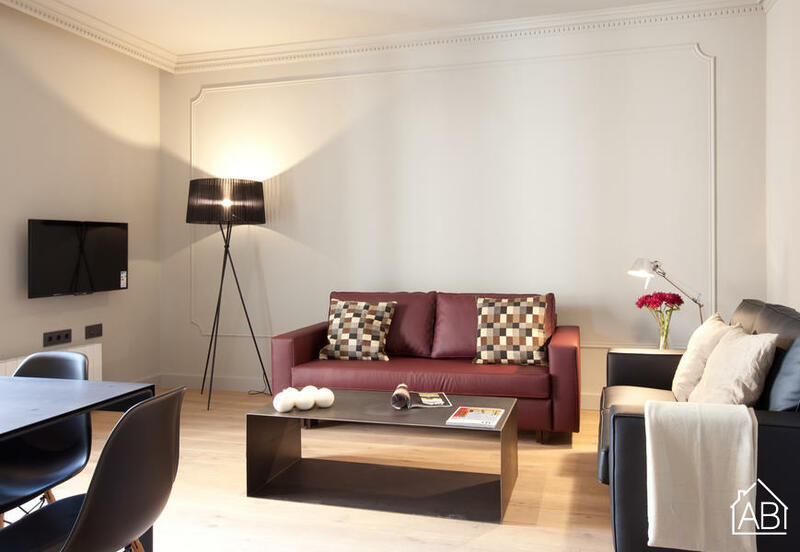 This designer apartment is located in the centre of Barcelona, near to the bustling Plaça Catalunya and Plaça Espanya. Located in the Eixample neighbourhood of Barcelona, this area is home to a number of fantastic bars, cafés and restaurants. You will find many areas of Barcelona are within walking distance to this apartment, however it is also well connected to other places in and around the city by public transport, including train, bus and metro. This modern apartment has a total of 3 bedrooms, all equipped with designer furniture, and can sleep up to 6 people. The state-of-the-art kitchen is fully equipped with everything you would need for your home-cooked meals and more. There is also a coffee maker, a dishwasher and a washing machine for your convenience. Located on the ground floor of this recently renovated apartment building you will also find a 24 hour concierge service should you need anything at all during your time here. The building itself has security cameras installed throughout. Complete with air conditioning and heating, this luxurious, designer apartment in Barcelona is the perfect home away from home at any time of the year.